If you have an interest in graffiti in Bangkok, you should check out a video about Alex Face, a local graffiti artist. He explains that in Bangkok, things are a lot more mellow – the artists actually go to talk with the owners and ask them: “Would you allow us to paint your wall? We can make it look really nice.” And if the owner says okay, they go ahead and do it, and if not, they don’t. There are illegal graffities too of course, but overall, the relaxed attitude of the people here makes things a lot easier and more pleasant, because it does not have the whole “war” feeling. You’ll have to click here to see the video, unfortunately it can not be embeeded in this site. 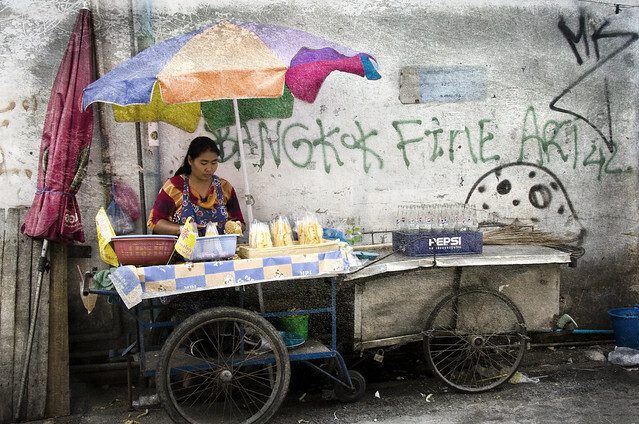 Another video here where you can check out a whole bunch of graffitis in Bangkok.